Twenty years ago the International Association of Scientologists (IAS) launched the Freewinds, a motor vessel based in the Caribbean. The purpose of the Freewinds is to provide a retreat for religious study and counselling. We saw a video of the social programs the IAS has funded this year. We’re proud to know that our church is active on the front lines of society and it was heartwarming to listen to the people we’ve worked with around the world say that we can be relied on to get the job done. Our Volunteer MInisters have been very busy this year with all the natural disasters that have occurred – we heard from firefighters in Southern California, the Red Cross in the Phillipines, teachers and religious leaders in India and monks in Myanmar. The VMs are getting known all over for their work in disaster relief. Some amazing data from someone who was a pharmaceutical rep. She is not a member of the Church of Scientology – just someone who has seen the inside workings of the drug companies. She talks about all kinds of drugs – including the fact that it has been proven that anti-depressants are not effective in most cases. Nice to hear an insider speak out. Here are some photos of our group at the bowling alley on Saturday night. Some of the teenagers showed us how to do it in style. And the results were awesome! A very successful fundraiser that will help us renovate our beautiful new building for the Church of Scientology in Old Town Pasadena. Last night about 100 of the Scientology Pasadena Parishioners went out for a night of bowling. What a lot of fun! 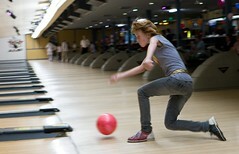 Many of us had not bowled for years, so as you can imagine the skill level was all over the boards. 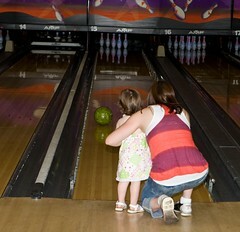 I had not bowled for about twenty years. I was surprised that I was still fairly good at it. Ages ranged from teenagers to a few in their seventies. 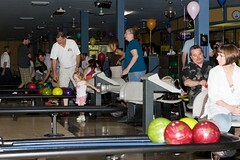 We bowled at the Bahama Lanes and the service was great. All the staff are friendly and helpful. 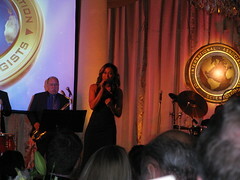 The purpose of the evening – apart from just having a good time and hanging out together – was to raise funds. 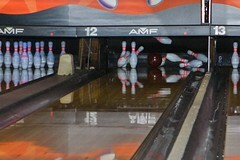 Some companies bought lanes and brought their staff along to bowl. I’ll post the photographs as soon I get them. 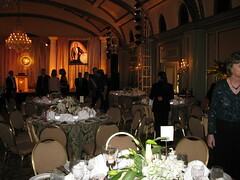 On Saturday night the International Association of Scientologists (IAS) held a Members’ Ball at the stately Langham Huntington Hotel & Spa, Pasadena, CA. It is a AAA Five Diamond Hotel and the building has been a landmark in Pasadena since 1923. If you’re not familiar with the Langham, it’s headquartered in London and was Europe’s first grand hotel. It opened in 1865. 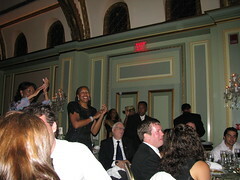 The Ball was held in the Huntington Ballroom and about 500 people came to see those who recently supported the the humantarian projects of the IAS get acknowledged. What kind of work does the IAS do? They support the Youth for Human Rights Leadership Campaigns in Africa, literacy programs in the US and other parts of the world, drug education in schools and drug rehab programs in many countries. Once the awards were done, we enjoyed a superb meal and spent time chatting to people we had not seen in a while as there were Scientologists there from LA and Orange County, not just the Pasadena Parishioners. Then we were treated to some excellent entertainment that had the crowd on their feet. There was a large contingent of Pasadena Parishioners at the Ball. One family had a group of about twenty people representing three generations! One of the community programs we’re most proud of is our Volunteer Ministers (VMs). They help out locally and internationally. Our Pasadena VMs worked at the California fires in the San Gabriel Valley recently. In December 2007 a team of seven Scientology Volunteer Ministers traveled to Uganda to help flood victims. More than 300,000 people were displaced, their food crops and livestock destroyed by the effects of months of heavy rain. One team just flew in to Myanmar to work with other relief organizations after the cyclone. The official death toll nearly doubled to 78,000 as heavy rains lashed much of the area stricken two weeks ago, further hampering relief efforts.